Cimarron Gets Digital Dental X-ray machine! Dental readiographs show us root infections, bone loss and tumors that we might not be able to determine just by looking at and probing the teeth. Without dental x-rays, infected teeth may be left in the mouth, even after a thorough dental treatment! Cats develop painful resorptive dental lesions, similar to cavities, below the gumline. The only treatment for this condition is extraction of the painful tooth. If we can’t see the lesion, don’t know it’s there, because we haven’t taken radiographs, we could leave our patients in pain! Dental Rads also tell us when we DON’T have to pull a tooth. Tooth tip fractures are common. If the pulp cavity of the tooth is exposed, the tooth should be either capped or extracted. If the pulp cavity is not affected, the tooth can stay in place and just be “watched”. The widened pulp cavity and dark area under the root of the fractured upper canine tooth told us this tooth was infected and needed to be extracted. The gums around this tooth looked normal. Being able to take radiographs of the inside of the mouth let’s us know whether oral masses are affecting the dental or boney structures of the jaw. And, they are a lot more easiy interpreted than whole skull rads– with far greater detail. 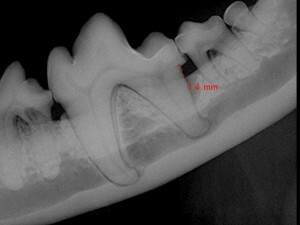 We have also used our dental x-ray machine to radiograph pocket pet parts! 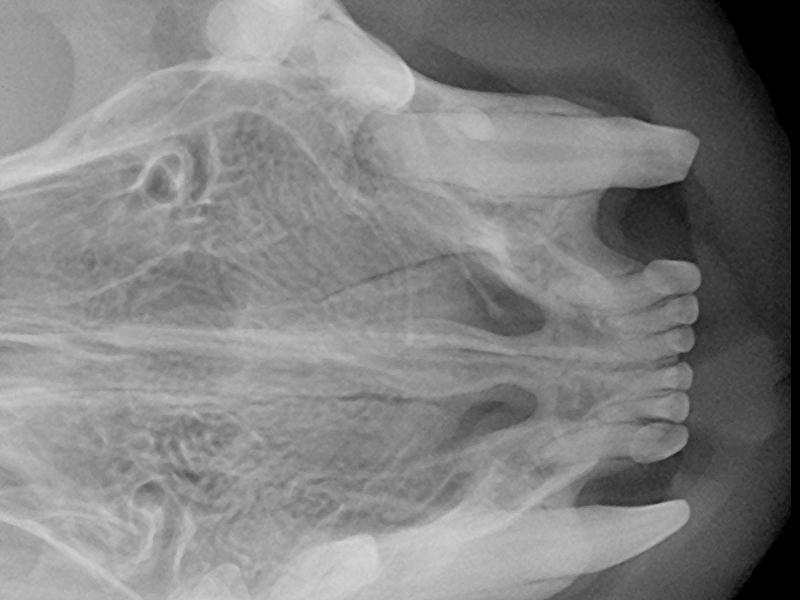 It’s a quick way to get a detail x-ray– as many as we need, given rats’ and guinea pigs’ tendency to wiggle– without anesthetizing the patient or having to do a whole body x-ray! 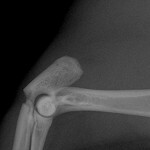 This image shows a guinea pig’s fractured elbow! Our pets don’t always tell us that their teeth hurt, or which teeth hurt, but radiographs can! For the best dental care, the most complete treatment, insist on dental radiographs every time your pet is anesthetized for dental work.